Just finished installing our first attempt at a cold frame. We built it with left over wood, miscellaneous hardware, and a window we found covered in dust in a back corner of the basement that we used to call our Blair Witch room (it was just creepy). The only materials I had to buy were the four pieces of wood for the window frame that I paid $4 for at the Habitat for Humanity ReStore in Summerside. I couldn’t find four pieces that fit in all my other wood. It is about 30 inches by 44 inches – almost nine square feet of inside space – 18 inches high at the back, about 11 at the front. It’s cold inside and outside the frame today. We’ll see how quickly the soil warms; we are eager to plant and get a jump on the season. I’ll post photos of our progress. With any luck, we’ll be eating fresh greens in a few weeks! This rocks. I feel like a real back-to-the-lander now. 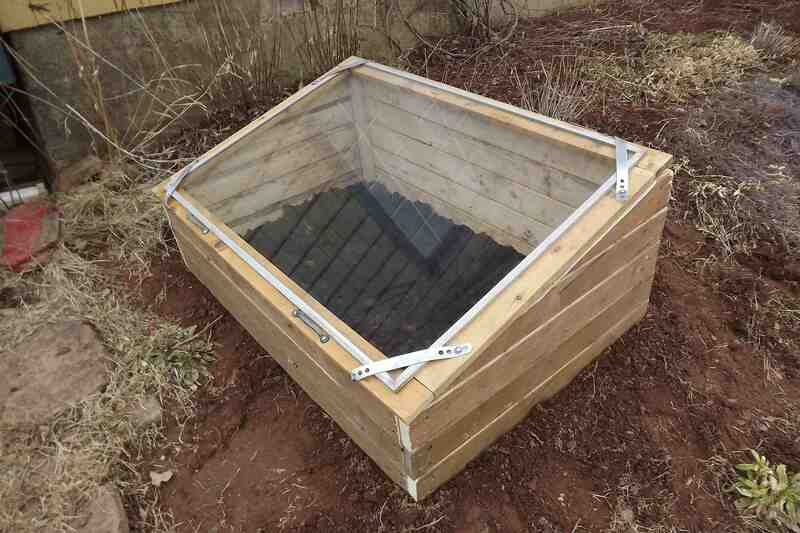 Looking forward to how your cold frame does. thanks! Today we have a blizzard. Might set us back a day or two! Planning on building something similar next year. Hope your’s works well for you. So far, so good. I may build another one if this one works out well. Good luck with yours!